A quick and cost savings place that we’ve found, and come to love, is Fragrance.com. Below are just a few amazing scents that you can find! 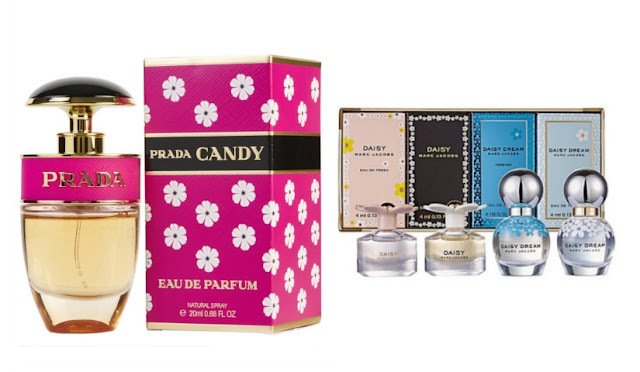 Prada Candy Eau De Parfum Spray ($44.99) – Prada Candy has a novel olfactory balance combining exceptionally high-quality ingredients in excessive proportions. Magnified by white musks, noble benzoin comes together with a modern caramel accord to give the fragrance a truly unique signature. Marc Jacobs Variety Daisy Set ($49.99) - This 4-piece mini variety set makes the perfect holiday gift for any fragrance fanatic. Set includes: Daisy Eau So Fresh, Daisy, Daisy Dream Forever, and Daisy Dream. Between delivering products with assured efficacy and Golden Door’s philosophies that align with our own, is it any wonder that this spa’s skincare products have made it into the TME Vault? (And Golden Door’s Artisan Foods have made it into our gift baskets!) Anyway … GD has introduced the Try Me Kit ($38) that contains TSA approved sizes of the Golden Peel-A-Way Masque, Bamboo Face Scrub, and Hydrating Cleaning Milk that are a combination guaranteed to bring life back to tired and dull skin! Baré Alchemy Ambrosia Collection Serum Minis ($50 each) make the perfect stocking stuffer! Ambrosia Protect Serum (for normal skin) - Containing Kakadu Plum and Caviar Lime Pearl, the Protect Serum boosts hydration at the cellular level. Rich in AHAs, this serum provides a gentle exfoliation, and stimulates the skin to reduce the appearance of aging and improve luminosity. Ambrosia Soothe Serum (for dry/sensitive skin) - Containing Kakadu Plum, Argan Oil and Tasman Pepper Berry Extract, the Sooth Serum restores hydration to the skin’s layers, boosts collagen synthesis and structural cellular integrity of dry, damaged, and sensitive skin. Ambrosia Cleanse Serum (for oily skin) - Containing Kakadu Plum, Manuka Oil and Tea Tree Leaf Oil, the Cleanse Serum boosts hydration with a blend of vitamins, minerals and hyaluronic acid. Anti-bacterial, anti-fungal and anti-inflammatory ingredients help minimize acne, blackheads and whiteheads. 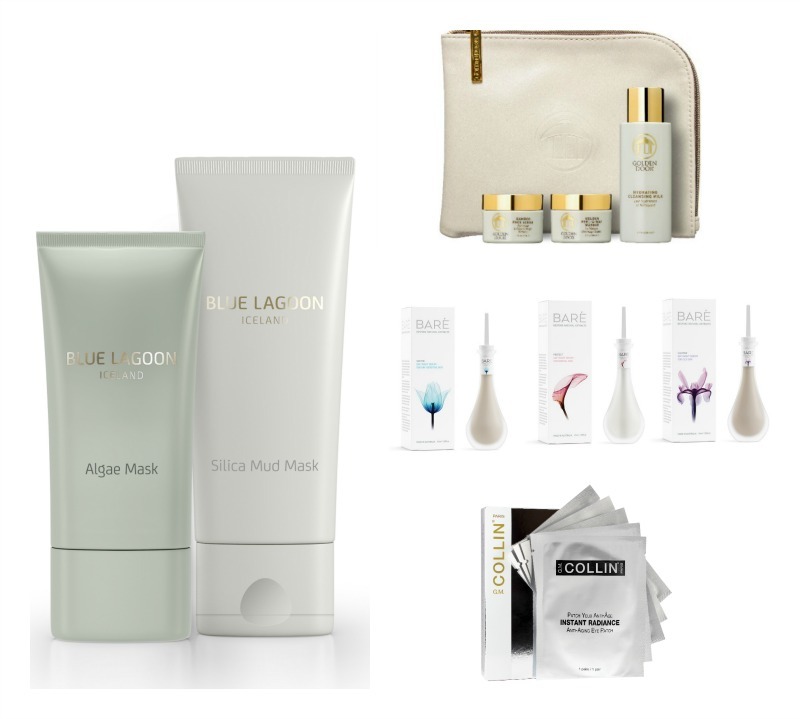 Blue Lagoon Iceland Duo Masks ($199) - From one of the 25 wonders of the world comes one of the most natural skincare duos for healthy, glowing and radiant skin, Blue Lagoon Iceland Algae and Silica Mud Mask! G.M. 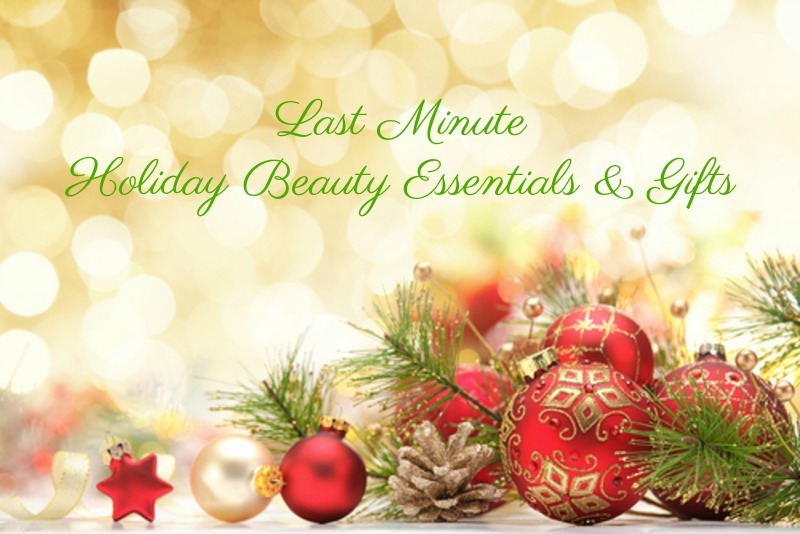 Collin Instant Radiance Anti-Aging Eye Patches ($50) - Prep you under eyes for the holidays! These eye patches deliver a quick relief from tired, stressed out eyes, providing a visibly younger and relaxed look in just 20 minutes. These can be used any time or anywhere, immediately reduce the appearance of fine lines, wrinkles, puffiness and fatigue. The unique mixture of active ingredients sink into the skin, leaving the eye area hydrated and rejuvenated. The eye contour is visibly revitalized with a more youthful appearance. 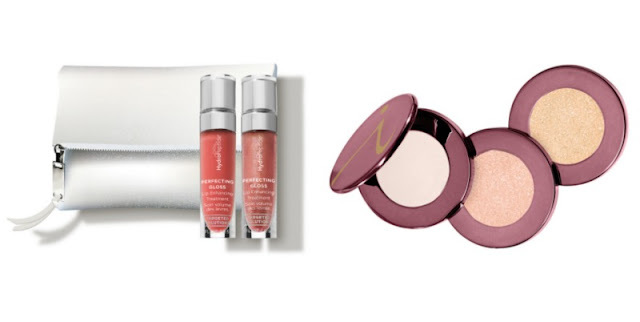 jane iredale Dream Luminizer Trio ($45) – Beautiful three-in-one expandable illuminating palette enriched with pine bark and pomegranate antioxidants for a soft-focus glow. Use anywhere on the face and body to add a candlelit glow on all skin tones. HydroPeptide Perfectly Plump Kit ($68) - Perfect your pout for the mistletoe without injections. HydroPeptide's Perfecting Gloss instantly adds volume, shine and hydration using plumping peptides. Not only is this pouch with glosses a perfect stocking stuffer, but also it's the perfect clutch-friendly, desk to dinner essential for party prep. VOLOOM Rootie The Rootlifter ($130) is a volumizing iron that takes seconds to work and provides major, long-lasting volume! We absolutely fell in love with this tiny wonder! It is also the perfect choice for finer, thinner or shorter hair. With ceramic-coated plates and a ¾ inch design, Rootie creates little pockets of volume close to the roots without leaving a clear texture in the hair, for natural-looking lift. And has a heated volumizing iron, Rootie heat-locks the volume into your hair, helping your volume last for days! Oh, while you're on their website you should check out the new styling product collection!